Small time criminals John (Anton Tennet) and Gaz (Arlo Gibson) decide to rob their boss Shelton (Jonny Brugh) after he collects a large sum of money from the Chinese. Betrayed by his partner in crime, John finds himself on the run from his criminal friends. He finds that a bracelet he took from the Chinese gives him the ability to escape by slipping through time. Using his newfound capability to time travel John teams with past versions of himself to create a Mega Time Squad to finish his heist and maybe just maybe, grow a pair. An action, adventure, time travel, comedy out of New Zealand from Tim van Dammen teams a squad of one against the most incompetent criminals New Zealand has to offer. Low budget and even lower intelligence has criminal bungler John growing a pair to take on the bad guys and possibly get the girl. 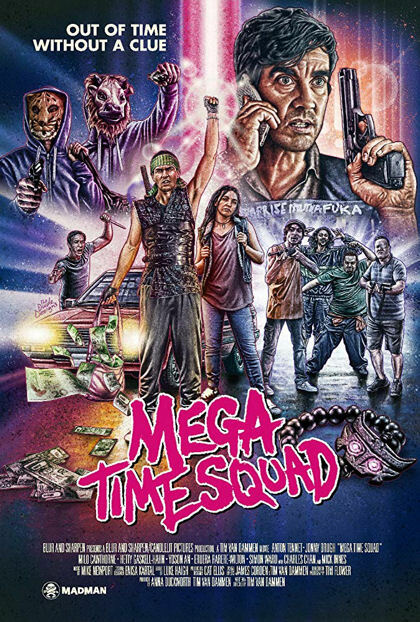 Reminiscent of the hour and a half comedies from the 80’s and 90’s Mega Time Squad lowbrow tackles some complicated subjects including love, time travel, becoming a man and facing your demons. Comedy is high, time travel logic low, horror is nonexistent but these kiwis know how to have throwback fun on film.